1Department of General Surgery, Mackay Memorial Hospital, and Mackay Nursing College, Taipei City, Taiwan, R.O.C. 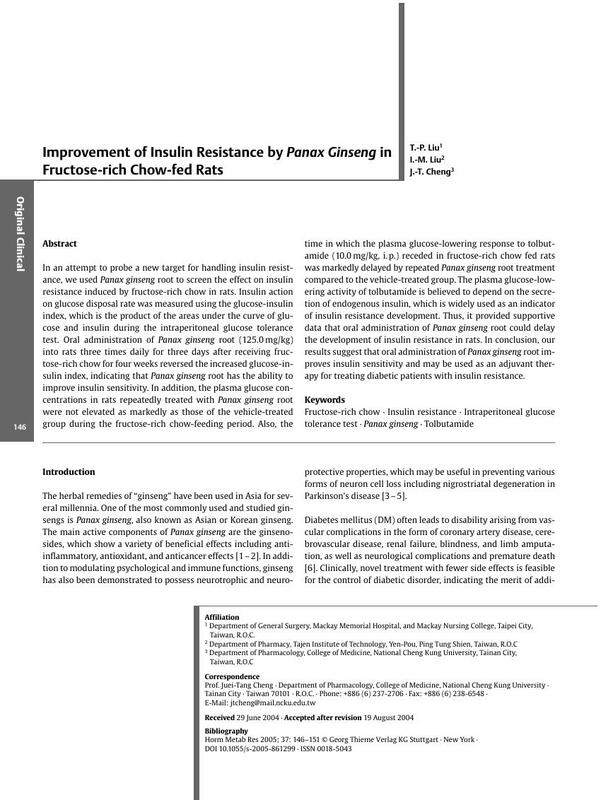 In an attempt to probe a new target for handling insulin resistance, we used Panax ginseng root to screen the effect on insulin resistance induced by fructose-rich chow in rats. Insulin action on glucose disposal rate was measured using the glucose-insulin index, which is the product of the areas under the curve of glucose and insulin during the intraperitoneal glucose tolerance test. Oral administration of Panax ginseng root (125.0 mg/kg) into rats three times daily for three days after receiving fructose-rich chow for four weeks reversed the increased glucose-insulin index, indicating that Panax ginseng root has the ability to improve insulin sensitivity. In addition, the plasma glucose concentrations in rats repeatedly treated with Panax ginseng root were not elevated as markedly as those of the vehicle-treated group during the fructose-rich chow-feeding period. Also, the time in which the plasma glucose-lowering response to tolbutamide (10.0 mg/kg, i. p.) receded in fructose-rich chow fed rats was markedly delayed by repeated Panax ginseng root treatment compared to the vehicle-treated group. The plasma glucose-lowering activity of tolbutamide is believed to depend on the secretion of endogenous insulin, which is widely used as an indicator of insulin resistance development. Thus, it provided supportive data that oral administration of Panax ginseng root could delay the development of insulin resistance in rats. In conclusion, our results suggest that oral administration of Panax ginseng root improves insulin sensitivity and may be used as an adjuvant therapy for treating diabetic patients with insulin resistance.